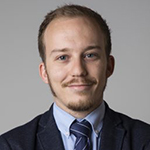 Florian is the Lead Blockchain Developer for the AFKL Blockchain Program. He has been working around innovations for several years. First as one of the first finalists of the "Customer priority" hackathon organized by Air France, and then as the first intrapreneurs thanks to the Air France Internal Incubation Program. Having successfully tested and launched the Hackathon solution, he was looking for another challenge. Passionate about new technologies and innovations, he discovered Blockchain and Bitcoin around 2011. He really started digging into it mid-2017. After several month of autonomous training and hours of research, he became Air France Blockchain Lead Developer in May 2018. Air France - KLM wants to use blockchain to improve cooperation, and productivity in its businesses within the group.